Sometimes it only takes a few ingredients to make a weeknight meal great, and this Five Ingredient Creamy Chicken Marsala is the perfect example of just that. 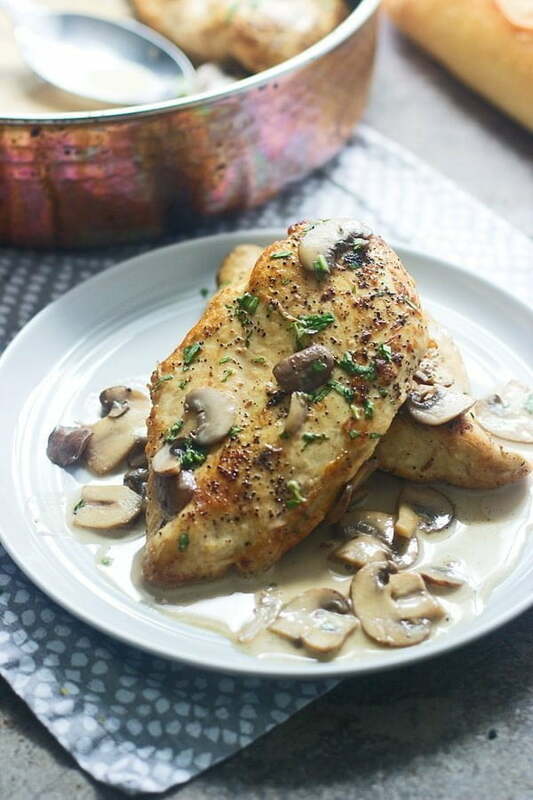 Chicken cutlets, hearty cremini mushrooms, rich marsala wine and of course, a little bit of butter are the perfect combination for this easy, but elegant dish. I have friends that cook, and friends that don’t cook. Obviously. The friends that don’t cook, love to eat, and while we have great takeout options around the city, occasionally they’re forced to put a skillet to a stove. 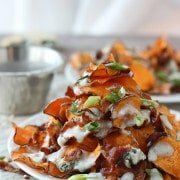 For those handful of friends, a recipe must include ingredients that are commonly known, even to the most novice of cooks, it must take 30 minutes or less, and preferably, the ingredient list shouldn’t have an obscene amount things to purchase outside your standard pantry items. 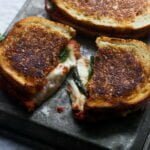 I have a few five ingredient recipes within the archives of this site (like this, this and this), and, according to those friends that “don’t cook,” these are the most prized items lurking around. They’re not intimidating, they don’t require a trip to a specialty store, and they’re still a heck of a lot more impressive than some greasy fast food. 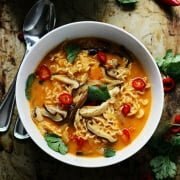 Because I want my friends to be able to actually cook some of the recipe I create, I’ve made a promise to them to create more five ingredient meals, plus now that I’m a new Mom, these easy recipes are a total lifesaver when I don’t want to spend any more time than I have to in the kitchen. Today’s five ingredient meal is a classic, simplified – chicken marsala. 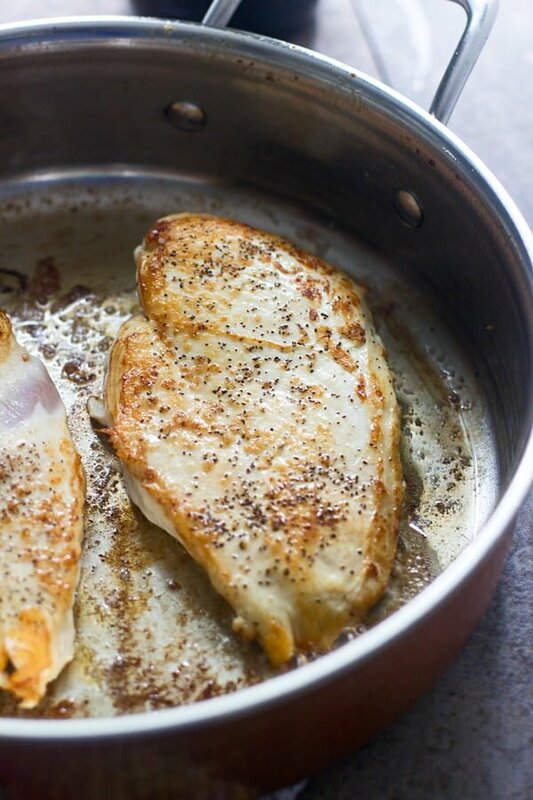 Chicken breasts are seared in a little bit of butter until they’re perfectly browned and cooked through, then set aside. A little over half a pound of cremini mushrooms are browned up in a little bit more butter (in the same pan), then hit with a generous pour of good-quality marsala wine and a little bit of heavy cream. The chicken is added back into the pot (along with any accumulated juices), and then everything simmers until the sauce thickens up a bit. I believe the whole process from start to finish, takes about 25 minutes, making this five ingredient wonder, something to be proud of. If you want to add one more ingredient in, a sprinkling of freshly chopped parsley should do the trick. Five ingredients, and full of flavor. This easy classic comes together in under 30 minutes, and only required five ingredients! Place chicken breasts in a plastic bag. Use a rolling pin to slightly flatten each chicken breast, you want them about ½ inch thick. Season chicken liberally on both sides with salt and pepper. Add remaining butter to the skillet, once butter melts add mushrooms. Cook 2-3 minutes until softened and brown. Add marsala wine, simmer until reduced by half, about 1-2 minutes. Add heavy creamy and salt. Simmer for 1 minute and then add chicken breasts along with any accumulated juice back to the pan. Cover and simmer until chicken is cooked through and sauce has thickened, about 2-3 minutes. Season to taste with salt and pepper. 20 Responses to "Five Ingredient Creamy Chicken Marsala"
It’s not easy to come up with 5-ingredient recipes that take less than 30 minutes and actually taste good too. But it looks l like you nailed it! 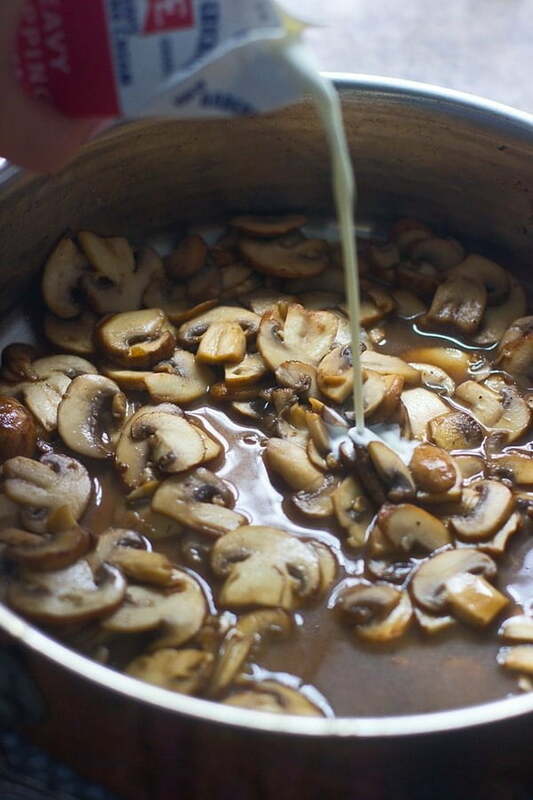 I love marsala wine with mushrooms…mmm, so good!! 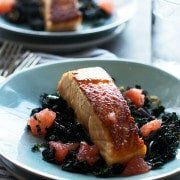 Easy and not a lot of ingredient recipes are always good to have on hand – especially for busy weeknights! 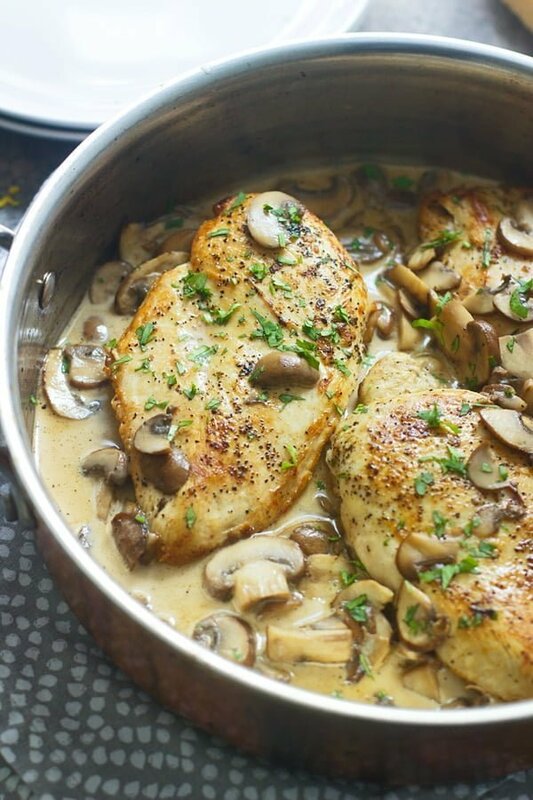 This chicken marsala sounds delicious! We grew up eating it all the time – it always reminds me of my childhood! I have made this a few times because Chicken Marsala is my husband’s favorite dish when we eat out. He thought it was delicious and so did I! Thanks for sharing! 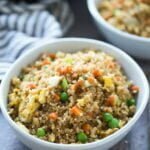 Easy and flavorful! So glad you like it Sara! We are of the LDS faith and do not keep any alcohol in the house. Is there something that I can substitute the for the wine? Or would it do ok to leave it out altogether? This looks too good to pass up! Unfortunately, to get that marsala taste, you do need to use Marsala wine, but you can find it in the grocery store, and it doesn’t have any alcohol in it. If you still can’t use that, then you could use chicken stock, it just won’t have that marsala taste! I’ve made this for years, great dish.You pretty much hit it spot on. Only thing my Italian grandma from Genoa did different was flour the chicken before sauteing, thickens the sauce, some crushed garlic with the mushrooms and the wine had to Dry Marsala. Just a thought. I was looking for a different way to cook chicken, I use flour and no cream. And it was sooo good, my husband loved it, so did I! Thanks. Years ago, earlier in my marriage, I did try a recipe for Chicken Marsala. I was so disappointed with it’s taste especially after all my effort I put in it. I swore off to never try making another chicken marsala again. 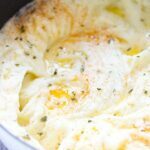 I came across your recipe by pure accident. We had it tonight. It’s so easy! Very tasty cream sauce. It won over the three of us! (Hubby, son and me). Will look forward to trying more of your recipe.